The Sender header is rarely used, and would only be needed in instances where you do not have the ability to update DNS records for the domain in the From Address. In GreenArrow Studio, this address is set in the Sender field. This document describes how to add a From Address Domain into GreenArrow Engine. This does not configure the domain name for use as a Return-Path or URL Domain. (A1) From Address domain - This is the domain to be used in the From address of your email. The From Address domain is the portion of the email address that comes after the @ symbol. For example, greenarrow-example.com is the From Address domain in [email protected]. (A3) Yahoo Credentials - You will need a Yahoo account of your own. If you already have one that you’d like to use in association with GreenArrow then you can use that. If you do not already have one you’ll need to sign up for a free account. (A4) Verification Email address - [email protected] the From Address domain (A1 from above). You will need to create a DKIM key in your GreenArrow Engine’s web interface. You will be creating the key for the From Address domain from (A1) above. Note: Make note of the “Selector” that you use here. This is needed below in the “Yahoo Feedback Loop application” section. Details on creating a new DKIM key can be found in the Creating a New DKIM Key page. 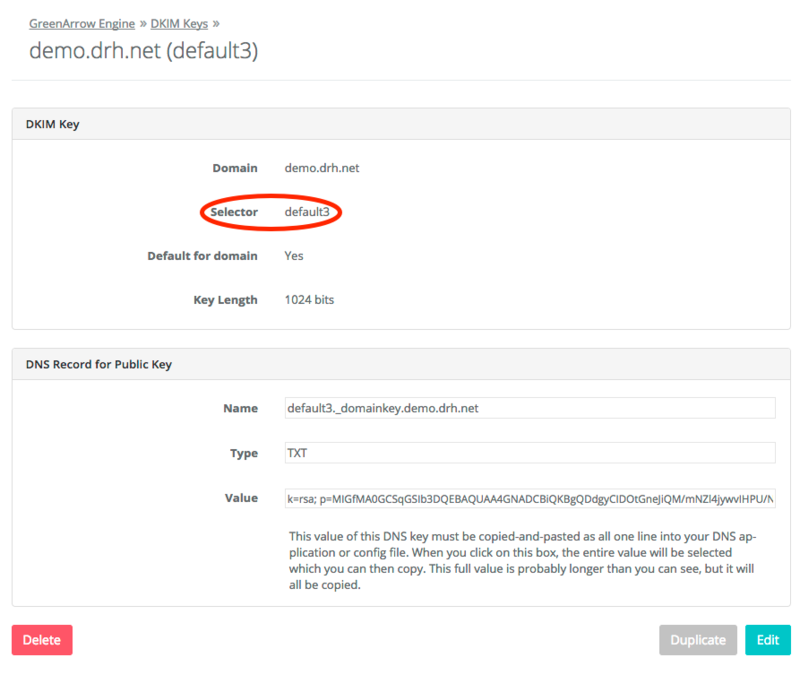 After a new DKIM key is created, the next step is to create the DNS records for it. Details instructions, including screenshots, can be found in the Creating DNS Records for DKIM page. If there are other systems that are sending mail for this domain (where this domain is in the From address or Return-Path address), you could impact those configurations if this is improperly set up. Be careful to pay close attention to this section to make sure you aren’t disrupting your production email environment. For your authorized IPs in this section, it is helpful to see if the list of IPs can be condensed down into their shorter CIDR specification. This is possible when you have multiple sequential IPs. To do this you can use a tool like this to convert a range into the CIDR specifications. If you can shorten these down to the CIDR specifications, make note of CIDR specifications, and use those in place of the individual IPs below. This section uses the domain “greenarrow-example.com” as an example domain. You’ll use your own domain instead when you’re actually creating this for yourself. Verify whether there are any TXT records in your existing zone file that begin with spf2.0/pra or spf1. This can be verified by entering your domain in the IP or Host section of http://www.whatsmyip.us/txt and clicking Go. If you have an existing record, proceed to the next section. If you do not have an existing record, skip ahead to this section. If you have an spf2/pra record and an spf1 record, you should edit the spf2/pra record. If you have only an spf1 record, you should edit that record, and not add an spf2/pra record. Based on the above, you’ll edit the existing record to add the IP addresses (A2) above or the CIDR specifications, if applicable to the existing record anywhere between the v=spf1 (or v=spf2/pra, depending on your policy) and the all mechanism. greenarrow-example.com TXT "v=spf2.0/pra ip4:1.2.3.4 ip4:4.2.3.0/24 -all"
greenarrow-example.com TXT "v=spf2.0/pra ip4:1.2.3.4 ip4:4.2.3.0/24 ip4:9.9.9.0/28 -all"
Notice the only thing that changed was the addition of “ip4:9.9.9.0/28” to authorize the new block of IPs. If there are no existing spf1 or spf2/pra records then you will need to create one. To do this, you’ll need to figure out if you can provide a full list of all IPs that need to be authorized to send mail for this domain. 3rd party services (like SendGrid or SMTP.com) that may be sending out emails. If you can provide all IPs, then you’ll use -all in this record. If you can not then you’ll use ?all. greenarrow-example.com TXT "v=spf1 a mx include:_spf.google.com ip4:1.1.1.2/31 ip4:1.1.1.4/30 ip4:1.1.1.8/30 ?all"
For more details on SPF and Sender ID you can review our documentation here. Once you have your email authentication set up, it is a good idea to test it out. You can do this by sending yourself a test email through GreenArrow to an email address that you own at an ISP where you know that Sender ID and DKIM are checked, and then reviewing the headers. For example, Hotmail / Outlook.com checks Sender ID and DKIM. In the examples below, you’ll need to replace DOMAIN with your actual From Address domain name (A1). The acronym “CFL” is used on this registration page. This stands for Complaint Feedback Loop. This is simply the term by which Yahoo refers to their Feedback Loops (also referred to as “FBL”). Click on the Edit users/forwarders link for the From Address domain you are setting up. Find [email protected] and click the “Edit” link if it exists. Add an address you can access in the Forward to box. Do not remove [email protected] or any other existing forwards from the list. If [email protected] does not exist, click the Add new email forwarder button. Add abuse in the Email address text field. Add the email address you wish this to forward to in the Forward to text box. Create a mailbox for [email protected] on the mail system being used for that domain that you can access. Create a forward for [email protected] on the mail system being used for that domain to point to an address you have access to. Send a test message to the [email protected] verification email address to confirm that you are in fact receiving email send to this address. Go to https://www.yahoo.com and login (A3). Once logged in, go to https://help.yahoo.com/kb/postmaster/ and click on the Complaint Feedback Loop button. Reporting Email: [email protected] (A5 from above). Domain: This is the From Address domain (A1) you wish to add.